We’ve been inside a lot this summer. We’ve had some crazy heat waves in NY this year that have produced dangerous heat and humidity levels. So my boys and I have been entertaining ourselves with indoor activities a lot. With my oldest turning five soon, and my little guy a bright little 2-year-old, we’ve been able to play some board games together which has been nice – and with so many games in our house to choose from, it’s a real boredom buster! 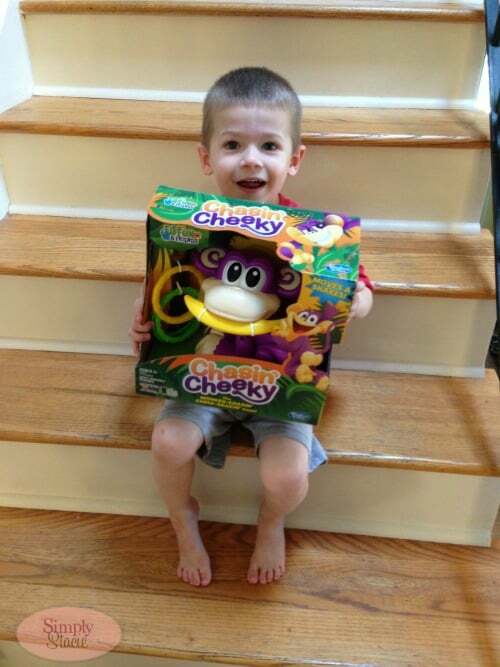 We have a new game in the mix now that both of my boys just have a blast playing called Chasin’ Cheeky from Hasbro. When the Chasin’ Cheeky arrived for review both of my boys were beyond excited. 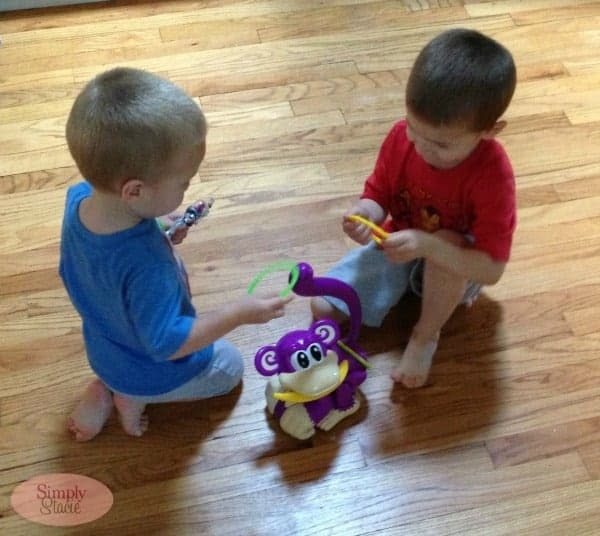 This cute little purple monkey intrigued my boys to the point where they just had to play it right that moment! All we had to do was take it out of the box, put in two C batteries and we were ready to play. The concept of this game is pretty straight-forward and was very easy for both of my boys to understand. 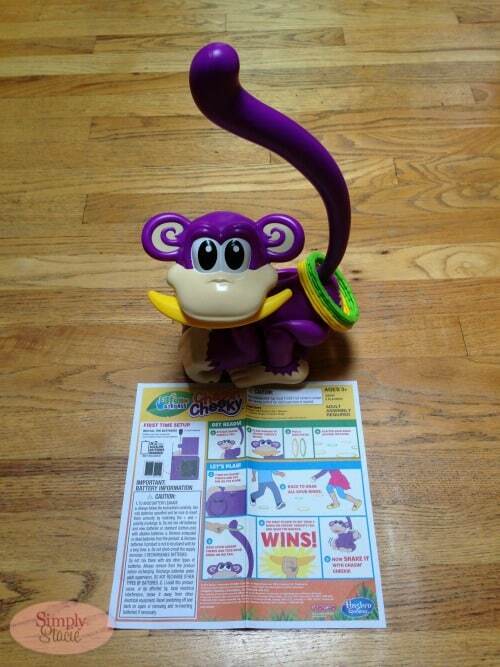 The object is to chase Cheeky and get your rings on his tail before any one else – and once you do, you grab the banana from Cheeky’s mouth and do a little victory dance! Both of my boys loved chasing Cheeky around the room, and we played over and over and over again. I love that this game is easy and active and really gets my boys giggling. Another great feature (at least for me!) is that it’s an easy game to store. The rings and banana store right on Cheeky, so there’s no need for a box or bin for pieces. This game is recommended for ages 3 and up and has an MSRP of $24.99. Hasbro has been around since 1923 and has brought so many great games and toys to the market, including Monopoly, Play Doh, My Little Pony, Nerf, and more. They are a company committed to environmental sustainability, product safety, ethical manufacturing and philanthropy. You can learn more about Hasbro and the games and toys they offer on their website. Gina is a working mom of two young boys, living in Westchester NY. She enjoys taking pictures, blogging and spending time with her boys in her spare time. this game looks like so much fun.my grands would love it. Pingback: From Nursery to Primary Giveaway Roundup (Plus Linky for All Giveaways) - Frugal Mom Eh!